Russian President Vladimir Putin says that 10 Russian paratroopers captured in Ukraine, near the border with Russia, had probably strayed across the frontier “by accident” and that he is waiting for a report from the Ministry of Defense on the incident. A group of Russian paratroopers detained on August 24 by the Security Service of Ukraine had crossed the Russian-Ukrainian border “by chance”, Interfax has been told by a source in the Russian Defense Ministry. “These soldiers were patrolling a section of the Russian-Ukrainian border, and had crossed it, most likely by accident on an open and unmarked section. They did not resist the armed forces of Ukraine during their arrest, as far as we know,” said the source. There had been no problems before, Putin noted. “I hope that in this case as well, that there will be no problems on the Ukrainian side,” he said. According to a statement from the Security Service of Ukraine (SBU), one week ago, the Russian paratroopers were transferred to the southern city of Rostov-on-Don from their regiment’s permanent base. The detainees were dressed in Russian military uniforms, but without any insignia and in camouflage overalls, while the identification markings on their military equipment were covered by paint. According to the Ukrainian news agency UNIAN, the original contingent of the paratroop unit consisted of about 400 soldiers – an artillery battalion, a reconnaissance company and support units. It was composed of 30 airborne combat vehicles, 18 Nona artillery units, and other vehicles. 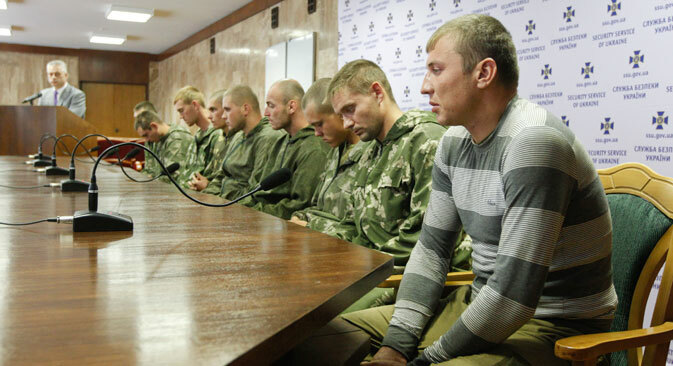 The Russian paratroopers, during interrogation, said they did not know how they had ended up on Ukrainian territory. According to them, their commanders had announced the launch of tactical exercises on the night of August 24, the unit was placed on alert, and, according to the Ukrainian military, was directed to march across the border towards the Ukrainian city of Ilovaisk, keeping radio silence. “We were driving off-road and over fields, and I do not even know where we crossed the border,” a man who called himself Corporal Ivan Melchakov of the 331st Regiment of the 98th Russian Airborne Division said in a video recording. In the published video interrogation, the soldier claims to have learned that he was on the territory of Ukraine only when the group came under fire. According to Viktor Litovkin, a retired Russian colonel and independent military expert, the video is confirmation that the Russian soldiers got lost after hours of marching, accompanying their column. “Moscow did not send its military men to fight in the southeast of Ukraine. When a military column is on the move, they always send out an advance guard, which moves in front of the column, and there are flank guards as well,” Litovkin told RBTH. “Apparently, these men were simply on the flank of the column, and at night, becoming disoriented, they crossed the Russo-Ukrainian border. The border is not marked there, with no signs anywhere warning about the presence of the border, so it is not surprising that they ended up on the Ukrainian side,” he said. Alexander Konovalov, president of the Institute for Strategic Assessments, said that the capture of Russian armed soldiers on the territory of Ukraine is a real present for Kiev, as now the government authorities will have a much easier time proving Moscow’s involvement in the fighting in southeast Ukraine. “We can expect the United States and EU to toughen their sanctions. Ukraine will also become much more insistent in asking for military assistance to build up its armed forces, and supplying them with modern weapons,” said Konovalov.